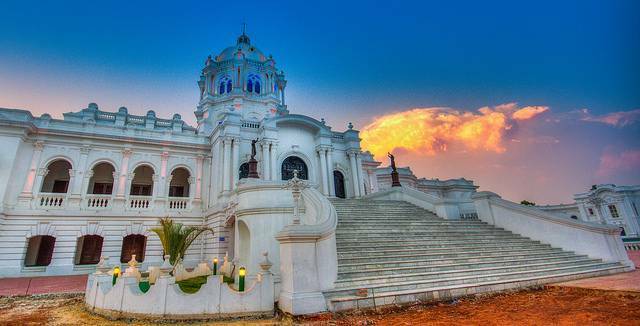 Ujjayanta Palace is one of the main attractions of Agartala city. This is a former royal palace, used as state legislative assembly of Tripura till 2011 and now converted into Tripura State Museum. The palace is spread over 28 hectares of land and has gardens, artificial ponds, musical fountain, temples and is built in the Indo-Saracenic architectural style. Its white facade looks bewitching in the daytime and basked in the glow of floodlights at night, it looks even more enchanting. The Tripura Tourism Department conducts guided tour of the palace.